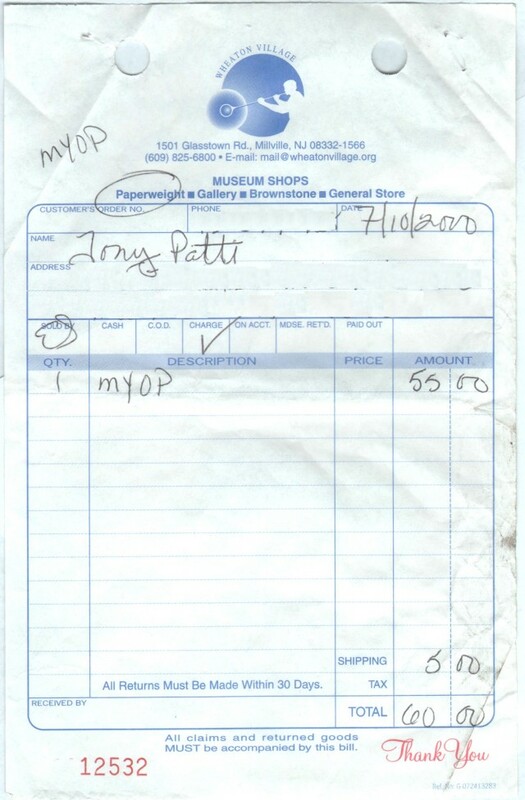 I’ve told the story in my CMOG Oral/Video History of Glass interview, so while cleaning up some old papers I came across the original invoice from my very first MYO (Make Your Own) Paperweight session at Wheaton Village (now Wheaton Arts) — dated July 10, 2000! My wife and I were driving back from the New Jersey State Barbecue (BBQ) Festival in Wildwood NJ the weekend of July 8-9, 2000 and she said that she had read about Wheaton Village and wanted to stop. I wanted to get home and get back to work, but wives can be persuasive, and we stopped there, and she could not pull me away from the Hot Shop demos, I was fascinated, and hooked!